Sorry about the delayed posting of photos yesterday, the dread bug felled me and I went to bed before dinner. I just didn’t have it in me to stand in the cold. Today dawned sunny and beautiful, I was so happy I celebrated by changing my underwear. We climbed 1400m steady up. Now at 3178m. The day started hot, sunny with risks of dehydration and sunstroke. We stopped at a wonderful Buddhist prayer centre for lunch. The Buddhist prayer centre was in the midst of prayers when we arrived. They allowed me to watch; very peaceful chanting with drums crescendo-ing (Mom is that a real word?) into a cacophony of discordant sounds, horns and drums. Lunch included Tibetan flat bread, Dale and I have decided to open a chain in Canada – way better than Krispy Kreme. Then it all changed. And the clouds came, and the wind came, and the heavens opened up on us. 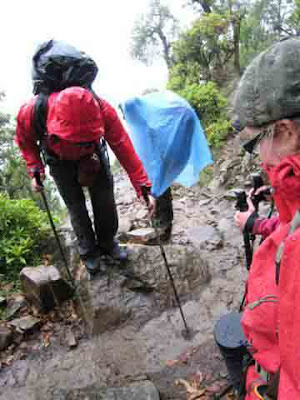 We spent the last 700m clmibing in pouring rain, hail, clouds, mist. The thunder boomed and I realized it was because we were in the eye of the storm. Rivers of mud flowed down the path, small rocks and twigs made their way down the hill; even the goats had enough sense to get out of the rain (photo). As we came close to cresting the pass the sky opened, leaving us with only a light haze, the sun came out and we could see the first of the snow covered peaks (not Everest though). The view was worth the price of admission. Even better the camp ground was washed out!!!!! !, wait for it, ………….so we were told we were staying in the LODGE!!!!!!!! dry, clean, warm, friendly, fanta, coca-cola. Amazing!! The morale of the team was so uplifted at the thought of a dry night and the opportunity for clothes to dry, to say nothing of yesterday’s laundry. Everyone in the group has now been sick except of course DALE, cause he is only immunosuppressed! Once again irony reigns. The team has bought stock in ciprofloxacin. God help us if we go through it again as I am not sure there is enough cipro left amongst us. Highlights of the day include a donkey parade carrying rice into Lukla. There are only a few modes of transfer of food across this path. Porter – a great one can carry 150kg > twice their body weight; average 100-120kg. We saw our first female porter. She was wearing a skirt and still carrying her 100kg up a totally stupid hill. About 5% of porters are female. Basically they function the same, same strength, same heights as the men. Donkey as well. 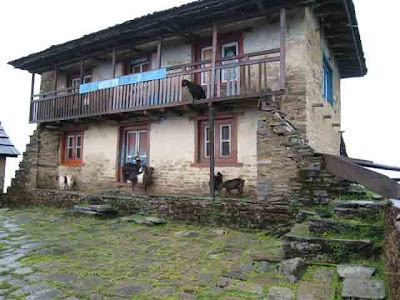 Otherwise things are flown into Lukla and brought back this way. 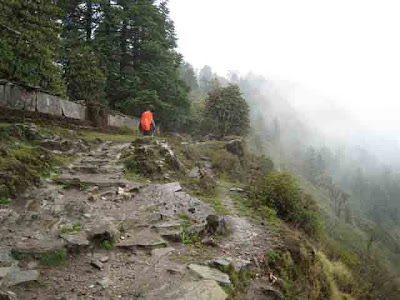 This trek we are taking is the only way to get from Jiri to Lukla, there is no road, no train. Takta – one of our Sherpa has been up a bunch of the biggest peaks here – Cho Oyu 8200m; Manaslu 8115m; Dhauligiri 8120m – Can you believe it – to say nothing of all the 5000-8000 m peaks that are too numerous to name here. Tomorrow we hope to see Everest if it is a clear day – we will also have the first viewing of our goal Mera. You’re bringing back great memories for me when we did the Everest Trail. I’m enjoying your daily notes. Sad that you’ve had the tummy/trots, etc. We all had that happen and all of us came back at least 10 lbs. lighter. One fellow 14 lbs. We didn’t do the trip to Jiri and up – we flew into Lukla from Khatmandu – quite an experience. Those good looking Nepalese pilots know what they’re doing. The sight of the beautiful mountains will live with you forever. The people are warm and giving. The prayer flags and prayer wheels are colourful and meaningful. Take care and keep in good health on this slug of a climb. I wish you all much success. gald to hear that you got out of the rain.It’s totally reminiscent of the may 24th canoe trips though. You just have to drop the temp to right around zero. I’ve tried to send you a couple of wonderful and clever notes but Sam had to break into your code Dale. Anyway keep up the good trekking and when it comes to the nepalese flatbread kiosks,well keep your day jobs. Its snowing hailing and bright sun here,every 5 minutes we get a nice change. Take care and thanks for the blogging Heather. Dale the Hoito was 90 years old yesterday. There is no holding you back. Take care Dale we are following your trek and Heather keep up with the great narative and pics.